Western Digital's SanDisk subsidiary and Toshiba have a long history of jointly developing and manufacturing NAND flash memory. While that relationship has been strained by Toshiba's recent financial troubles and attempts to sell of their share of the memory business, the companies are continuing to develop new flash memory technology and are still taking turns making new announcements. In recent months both companies have started sampling SSDs using their 64-layer BiCS3 TLC 3D NAND and have announced that their next generation BiCS4 3D NAND will be a 96-layer design. Yesterday Western Digital made a small announcement about their other main strategy for increasing density: storing more bits per memory cell. Western Digital will introduce four bit per cell QLC parts built on their 64-layer BiCS3 process, with a capacity of 768Gb (96GB) per die. This is a substantial increase over the 512Gb BiCS3 TLC parts that will be hitting the market soon, and represents not only an increase in in bits stored per memory cell but an increase in the overall size of the memory array. These new 3D QLC NAND parts are clearly intended to offer the best price per GB that Western Digital can manage, but Western Digital claims performance will still be close to that of their 3D TLC NAND. Western Digital's announcement did not mention write endurance, but Toshiba's earlier announcement of 3D QLC NAND claimed endurance of 1000 program/erase cycles, far higher than industry expectations of 100-150 P/E cycles for 3D QLC and comparable to 3D TLC NAND. 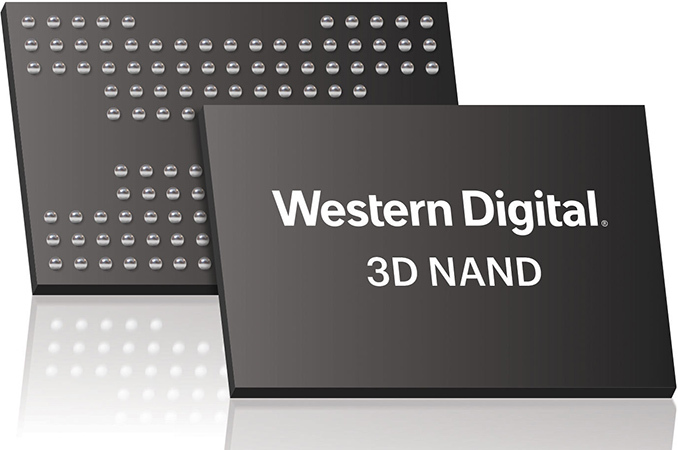 Western Digital has not announced any specific products based on QLC NAND flash, but they will be exhibiting both removable media and SSDs using QLC NAND at Flash Memory Summit August 8-10. Western Digital's CTO will be delivering a keynote presentation at FMS on August 8, so more details are likely to be revealed in two weeks. Western Digital's roadmaps also include plans for QLC parts on their 96-layer BiCS4 process, with capacities up to 1Tb (128GB) per die. BiCS4 production is scheduled to ramp up over 2018 and 2019 with the QLC parts expected to arrive later in the cycle, so Western Digital's first-generation 3D QLC based on the BiCS3 process will probably be their highest-density flash memory in mass production for over a year. Maybe it's because of the proxy we use at work (not sure, I didn't set it up) but the giant banner on top and video ads in particular seem new to me. The from the web ads are just annoying, though I know you guys already know that. What really bothers me is that on my desktop and laptop if I open anandtech without adblock and wait a minute or so, scrolling stutters horribly. It's so bad that I've been forced to turn on adblock to keep this from happening. Doesn't happen on mobile though.